Romanian-born artistic gymnastics legend Nadia Comaneci was barely 14 years of age when she stunned the world by scoring the first ever 'perfect 10' in gymnastics at an Olympic Games event. Her execution was so flawless that even when watching Comaneci's performance on that spectacular day in 1976 in slow motion, it is impossible to find any faults. Though the Romanian team lost out to the Soviet Union at the Montreal, Canada Olympics Comaneci won the hearts of gymnastics enthusiasts around the globe, and to this day some 40 plus years later her name synonymous with artistic gymnastics. Comaneci's winning attitude and love of the sport has inspired many young girls to learn gymnastics, some hoping to emulate her performances one day, but due to a change in the way artistic gymnastics events are scored now it is impossible for any gymnast, regardless of how good they are, to score a 'perfect 10'. This means that Comaneci will remain the reigning Queen of artistic gymnastics for as long as the scoring system continues as it is. Comaneci began training as a gymnast from a very young age, as many girls do, and was enrolled in gymnastics lessons by her mother in order to give her an outlet for all the energy she had. She drew the attention of her soon-to-be coach Karolyi when she and a friend were turning cartwheels in the school playground. Karolyi was keen to train both Comaneci and her friend Viorica Dumitru and had established a gymnastics school in Comaneci's hometown, making it possible for her to commute to lessons for the first years of her gymnastics career. She was just 7 years old when the husband and wife coaching team of Bela and Marta Karolyi started her on what was to be a path to world fame. Her friend Viorica Dumitru was destined to become a world-class ballerina. By 1970 Comaneci was getting her first taste of gymnastics at the competition level as a member of the team representing her hometown. An inkling of what her future held became evident when Comaneci won the Romanian Nationals, the youngest gymnast ever to do so. The following year saw Comaneci participate in gymnastics competitions at the international junior level. When Romanian and Yugoslavian teams met to battle for the gold, the Romanian was victorious. The win was largely because of Comaneci gaining her first all-around title, the first of many to be won over the following years. During the following 2 years, Comaneci participated and competed in a number of gymnastic events, both national and international, competing against the best junior gymnasts from countries such as Poland, Hungary, and Italy. It was a time that was spent perfecting her skills in preparation for what was to come. The training and competing paid off in 1973 when Comaneci competed at one of the more important events for junior gymnasts the Junior Friendship Tournament, winning gold for uneven bars and vault, and topping it off with the all-around gold. In 1975, at age 13, Comaneci's international success took a large leap when she competed at the European Women's Artistic Gymnastics Championships hosted by Skien in Norway. Her performance in all events aside from the floor exercise netted her the gold medal. She narrowly missed the gold for the floor exercise and was placed second. Her success did, however, earn her the all-around gold. 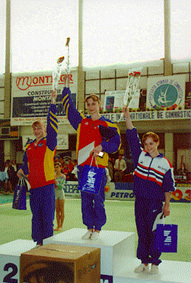 Comaneci's success that year continued with more wins at the Champions All event and the Romanian National Championships. When qualifying for the Montreal Olympics Comaneci competed against one of the greatest gymnasts Nellie Kim. The two had competed against each other many times over the previous years, and so Comaneci knew she had to perform at her highest level of accomplishment in order to earn the right to compete at the Olympics, and did so successfully, gaining gold in the balance beam and the all-around. Nellie Kim beat Comaneci out of the gold in the vault, uneven bars, and floor, leaving her with the silvers but her attendance at the Olympics assured. Participating in an Olympic game is an honor for any athlete, but to compete against the best the world has to offer at the mere age of 14 was something that very few got to do. To win several gold medals at that age was virtually unheard of, and yet Comaneci took first place time and time again, and along with the other members of her team members made the world sit up and take notice of the world-class winning skills of the Romanian gymnasts. She made world gymnastic history with her "perfect 10", an accomplishment that was extremely rare in any competition, let alone the prestigious Summer Olympics. Comaneci continued to dominate the women's gymnastics competitions over the following years, representing her home country, but life in Romania was becoming increasingly difficult to bear, with Comaneci reaching a point where she felt she was a prisoner. In November of 1989, she and a small number of her country people defected, traveling for the most part on foot under cover of darkness to avoid detection. Comaneci's efforts to defect saw her travel through various countries until finally reaching the safety of the United States, where she has resided ever since. Today Comaneci is still remembered for her Olympic winning performances but spends much of her time promoting her beloved sport of artistic gymnastics, living a happy and productive life with her longtime friend and husband, Bart Conner. One of the great passions of the sporting couple is the Special Olympics for which they both work tirelessly to raise awareness and funding. Though her famous "perfect ten" occurred over 40 years ago, Comaneci is still very much a household name in the world of artistic gymnastics.